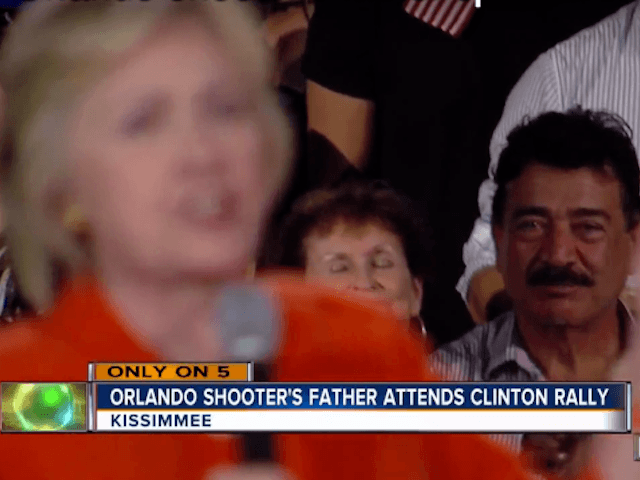 How did Seddique Mateen, the father of the Orlando terrorist who attacked a gay nightclub killing 50 people, end up on stage directly behind Hillary Clinton? The Clinton campaign has not pinned the blame on a campaign staffer, but rather feigned ignorance about Mateen’s presence at a rally in Kissimmee, Florida — just 30 minutes from the Pulse nightclub. “This individual wasn’t invited as a guest, and the campaign was unaware of his attendance until after the event,” a Clinton campaign official said in an email to reporters. But the campaign has not explained who was responsible for putting the controversial figure on stage. “I am a member, so as a member, I get the invitations. There’s nothing particular about it,” he said. Mateen would likely have been screened as he entered the event, although to appear on the stage with Clinton he would likely require additional screening by the Secret Service or be hand selected by a staffer. “Those behind the candidate are almost always screened in advance,” a campaign staffer for a former presidential candidate who had Secret Service protection explained in an interview with Breitbart News. He admitted, however, that a staffer would frequently vouch for additional people who could join the candidate on stage during the rally. He explained that it was highly unlikely that the Secret Service would allow a person to approach or stand on the stage behind the candidate, without advance screening or explicit permission from a member of the campaign. According to pictures of the event, the Secret Service had bike-rack guards separating the crowd from the stage with agents protecting Clinton. According to video of the event, Mateen also got close to Clinton while she greeted supporters after the rally. The Secret Service declined comment on the incident, citing the need to keep sensitive security details from the public.